Simplicity is the secret of most terminal rigs, and the basic tools required to construct your own rigs are few and uncomplicated. The most essential tool of the rig maker, a pair of nail clippers, ensures that all knots are trimmed close. Hooks and swivels that sprout a long tag of monofilament are not only unsightly to the rig purist, but they put fish off the bait or collect weed on the rig. Fish bumping into the short spike of mono may not be deterred from eating the bait, but if they are, then that's a fish missed – better to trim knots close after they have been fully tightened. The clippers can also be used to cut the end of your mono at a sharp angle to assist with the threading of beads, crimps etc. They will also cut wire line, although this tends to wear them out quickly. Available in several sizes, the largest clippers are the most efficient. They are, though, made mainly in the Far East in cheap chrome plate steel and tend to rust, blunt and get lost in the tackle box. Look out for a tough new set of stainless clippers from Fox! Special rig jigs are available, or you can use a tape measure to set the length of your rig and keep snoods uniform. However, a measure is not essential in rig construction. Experience allows you to judge lengths of snoods etc so that they do not overlap or tangle. The overall length of a rig, for instance, can be 6ft – the length of your outstretched arms. Snoods can vary between a few inches and several feet long. The rules on this are simple – there are no rules! Crimping pliers ensure that crimps are closed, but not crushed too tightly. If they were, they would damage the rig’s main line, a point to beware of when using other types of pliers. Crimping pliers can also be used for pulling knots tight on hooks and swivels – especially hooks, which can slip if you hold them in your fingers. Never hold hooks in your teeth or mouth to tension knots, this is asking for an accident! Pliers are also ideal for opening the eye of a lead link or metal boom so that a swivel can be added; offsetting hook points; or bending the eye of a hook for use with a Pennell rig. Cigarette lighter: Used to blob/melt ends of knots, joints to braid line etc. Braid scissors: These are essential if you are using braid, which is difficult to trim close with ordinary scissors or clippers. Side cutters or pliers: Strong side cutters may be required for cutting stainless steel wire, etc. Hook puller: A safer way of pulling knots tight. Avoid putting hooks near your mouth to tighten knots – it’s Russian roulette, and sooner or later you will get a bite! Leatherman-type multi-tool: Useful for odd angling jobs. The best ones are stainless steel which resist corrosion if left in the tackle box. Felt tip pen: Used to permanently mark rig bags with the contents. Others: Other essentials for shore angling include a sharp filleting knife and a pair of rust resistant scissors. Detachable terminal rigs offer the shore angler a way of overcoming several problems encountered when fishing. First, if terminal tackle is damaged, tangled or lost it can be replaced in an instant – simply clip on a new rig. This saves lots of time when the fish are feeding, because a spare rig can be ready baited prior to each cast, while the option to change the rig type, number and size of hooks etc also brings advantages. Two efficient ways to store terminal rigs include the popular rig wallet and the increasingly popular foam winder which comes from the Continent. Rig wallets come in a range of sizes and designs, some with extra compartments for your terminal accessories, line and rigmaking tools. You can expand the capacity of a rig wallet by storing each individual rig in a sealable plastic bag. This keeps the wallet clean when you return a used rig to it. Coiling the rig around your hand is a popular way to store it in a rig bag, although it is likely to tangle unless removed with care. Wrapping the rig around a piece of card can improve ease of removal. Marking your rig bags with the content, such as number of hooks, size, rig type etc improves efficiency. 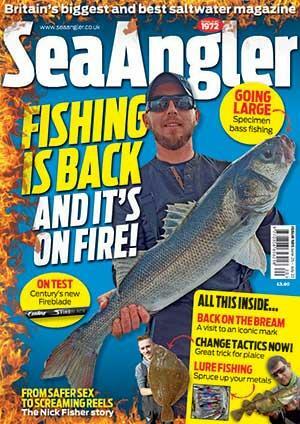 Some anglers use coloured beads of snood line to relate to rig type etc. Growing in popularity are the Continental rig winders. These are particularly efficient for storing the longer, lighter line rigs used by match anglers, and are far less prone to tangling than conventional rig bags. Terminal rig components and accessories are forever changing, with new ideas coming to the sea angling scene regularly. The rigs in this book include the latest ideas and options, but first here are a few terms and names to help you along. Rig body line: Specialist co-polymer rig lines are becoming more readily available. These have less coiling ‘memory’ and often more knock strength, and are smoother for knot tying. Snood line: Similarly, special snood lines are produced that combat the twists and damage caused by small fish and the marine environment. Swivels: There are a range of types and sizes, with some having a mix of round and diamond eyes specifically for use tying rigs. A minimum of 60lb-plus is recommended for joining rigs to main line etc, while 45lb swivels are standard for hook snoods. Lighter, smaller swivels can be used on some terminal rigs when required. 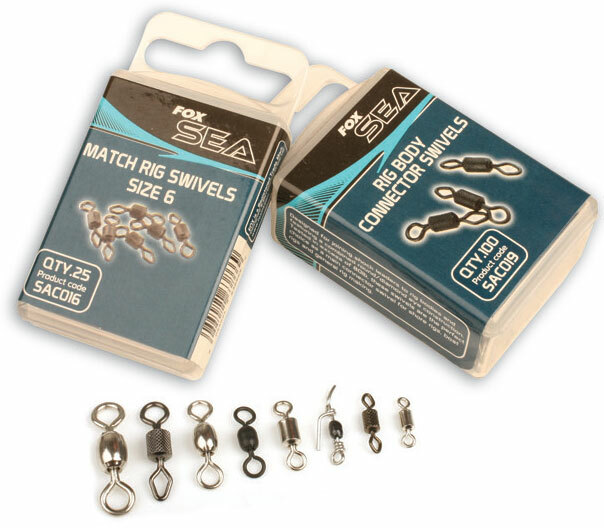 Swivel selection includes round and diamond eye, black and stainless from Fox, Berkley, Mustad and Gemini. Clips and lead links: Gemini Genie lead links are required for sinkers and main line quick links. Crimps: These come in a rage of styles from lots of manufacturers. Short, soft copper crimps or stainless steel are preferred because they do not corrode or damage the line. Plain steel crimps tend to rust. Beads: Small micro beads are available from manufacturers like Fox and Gemini, and various tackle dealers. Larger beads can be used as snood stops, or to add attraction to bait. Float beads can be used to raise baits clear of crabs, or to add buoyancy to a bait. Sequins and blades: 2cm-plus sequins and Fox blades in a range of colours can be used for bait stops, or as fish-attractors on hook snoods. Power Gum: This stretchy material in 15lb to 20lb breaking strain, and in many colours, is used to form a stop knot on the rig. Drennan and Fox brands are preferred. Power gum stop knots have a number of uses on the rigs shown here. Mono line can also be used. Telephone wire is a stop gap for an emergency stop knot – available in lots of colours, it is simply twisted around the hook snood. 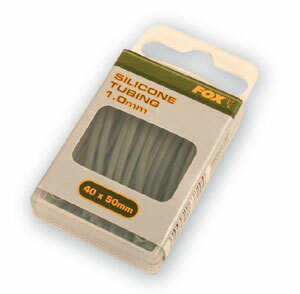 Rig tubing: Fox Silicone tubing has a host of uses, from making rigs, to bait stops, to snood stand-offs, in all colours. Bait clip swivels: Fox and Breakaway (Cascade) swivels with built in bait clips are used for all clipped rigs. In multiples they release simultaneously. Bait clips: The Breakaway Bait Shield and the Imp Clip are considered the two best bait clip devices after the Impact lead. Breakaway Impact Lead: Considered the most efficient and fail safe of all bait clip devices – the release clip is moulded into the lead. Snood clip: This is small clip device takes the place of a swivel on rigs. It is used to secure a hook snood via a short length of tubing.